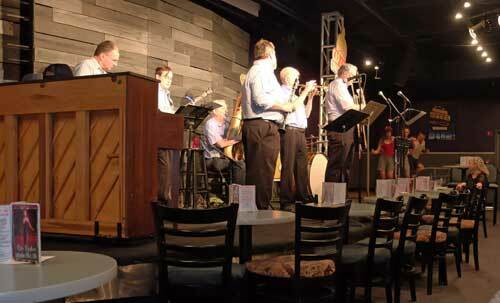 The Austin Traditional Jazz Society will open its 2018-19 season with the Silver Creek Jazz Band on Sunday, September 16 from 2 to 5 p.m. at Cap City Comedy Club, 8120 Research Boulevard, Austin. Silver Creek Jazz Band, a seven-piece traditional jazz band featuring a lineup of veteran jazz musicians, has been a fan favorite since its founding in 2007. The band is led by valve trombonist Dave Stoddard, an East Coast transplant who has been in Austin since 2001. He will be joined by cornetist Larmon Maddox, a distinguished lead player and soloist with many local jazz ensembles. Ben Saffer, another East Coaster, will play clarinet. 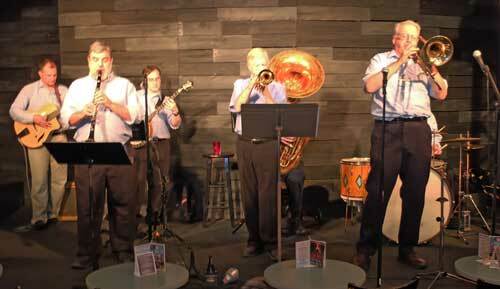 Dan Augustine, a mainstay of the Second Line Jazz Band in recent years, will play tuba. Dan got his start as a symphony orchestra player in Nevada but has done good things for Austin traditional jazz bands. Jimmy Vence is a Django Reinhardt devotee and a fine soloist on guitar. Bobby Black is a Jim Cullum alumnus who plays solid banjo. The rhythm section is rounded out by Rob Schmidt, a big band drummer who also does a great job with small jazz ensembles. When: Sunday, September 16 from 2:00 to 5 p.m. Doors open at 1:00 p.m.
attend--$10.00 cover. Students with ID, $5.00.